Oh yeah, I went there. 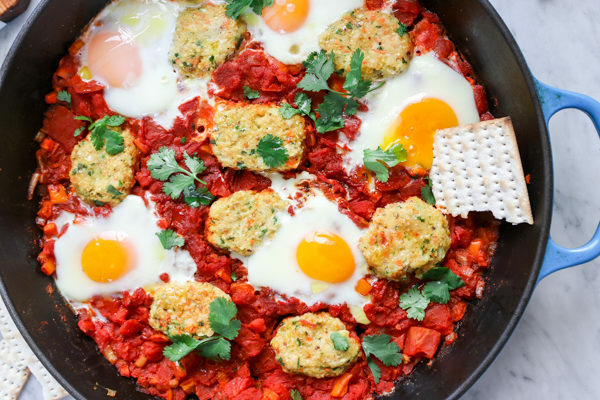 Gefilte fish meets shakshuka in the most epic Ashkenazi Sephardic mash-up since harissa chopped liver. 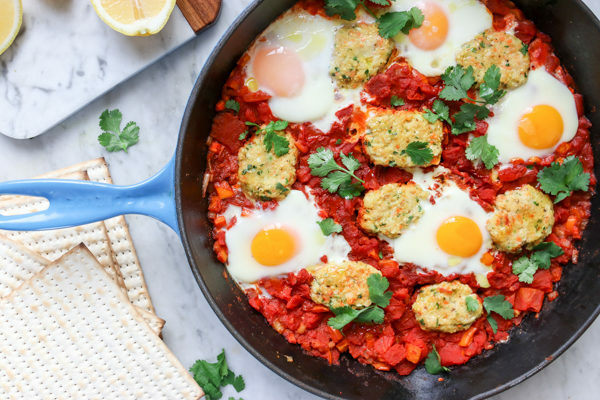 Okay, harissa chopped liver isn’t a thing (yet, that is) but Gefilte Fish Shakshuka is! 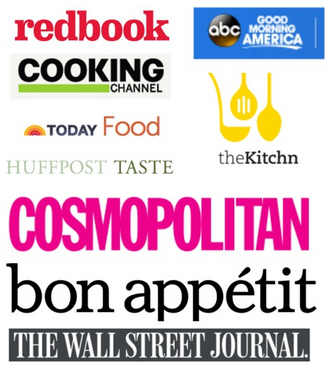 I got the idea as I was thinking of ways to reinvent gefilte fish and also was thinking of making a Moroccan poached fish and boom! An idea was born. I consulted my Instagram peeps and the consensus was, well, that’s just crazy enough to work. And it did! 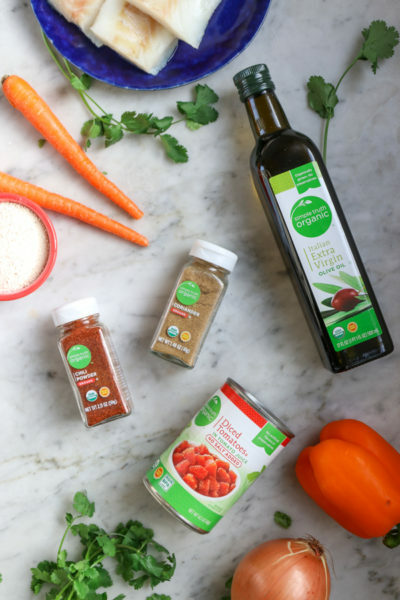 I am partnering with Kroger Simple Truth Organics to make a new Passover recipe, and thought this would be a perfect way to use some of my favorite organic ingredients. Hosting Seder can get pricey, so I love that Kroger has organic products that are healthful and affordable. Elijah would approve for sure! I stocked up on olive oil, spices and tomatoes and got to work. I used cod fish here, but other white fishes or even salmon would be nice. In went a carrot for sweetness and cilantro for freshness. I also added some carrots to my shakshuka base as a nod to the carrot hat gefilte fish always wears. Instead of horseradish, spicy chili pepper adds some heat. Instead of my beloved crusty bread, serve with matzah, which is surprisingly nice! Kind of a deconstructed matzah fish pizza? Or something. A squeeze of lemon and more cilantro with some fatty egg will turn your gefilte fish haters into believers. 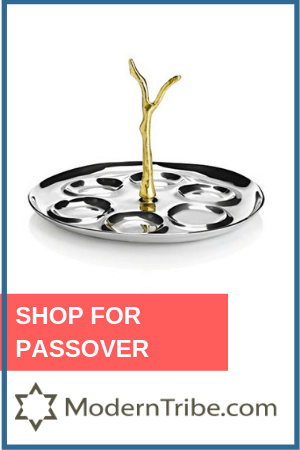 You’ll wish Passover came more than once a year. Oh yeah, I went there. 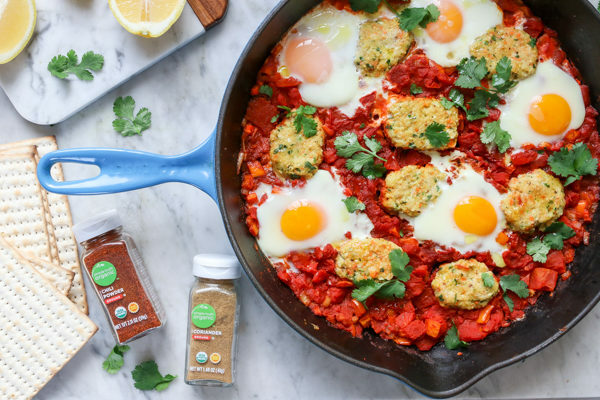 Gefilte fish meets shakshuka in the most epic Ashkenazi Sephardic mash-up since harissa chopped liver. 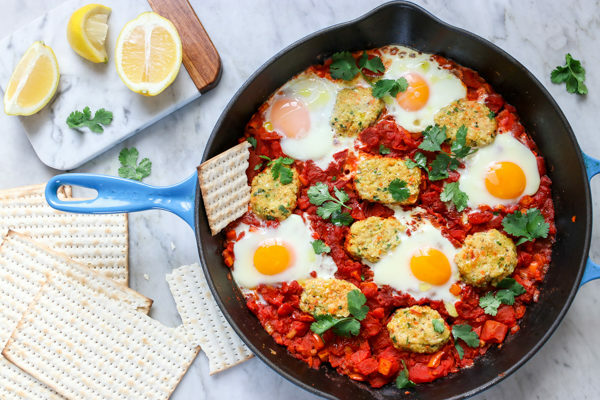 It's Gefilte Fish Shakshuka! 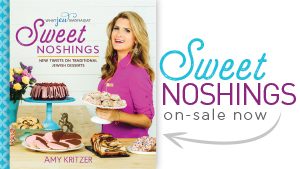 First, make your gefilte fish patties. 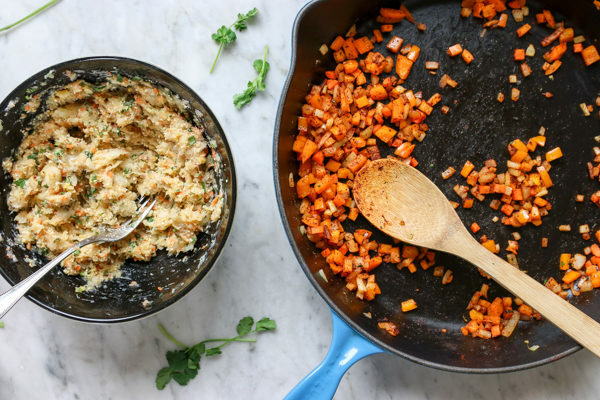 In a food processor, pulse together carrot, onion and cilantro. Then add fish and pulse just until shredded. 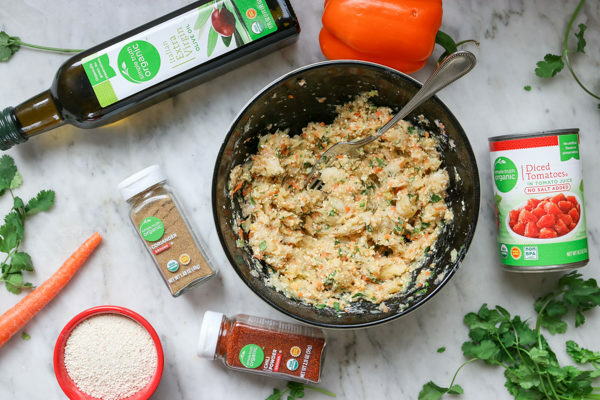 Transfer to a mixing bowl and stir in egg, Kroger Simple Truth Organics Coriander, salt, pepper, matzo meal and 1 teaspoon Kroger Simple Truth Organics Extra Virgin Olive Oil. Set aside. Heat a large saute pan or cast iron pan over medium-high heat. Add 1 tablespoon Kroger Simple Truth Organics Extra Virgin Olive Oil and heat. Then add onion, carrot and pepper and salt and saute for 7 minutes until soft and nicely browned. Add Kroger Simple Truth Organic Chili Pepper, and Kroger Simple Truth Coriander and saute until fragrant, about 1 minute. Then add the diced tomatoes and their juices and stir. Season with salt and pepper to taste. Reduce to a low simmer. 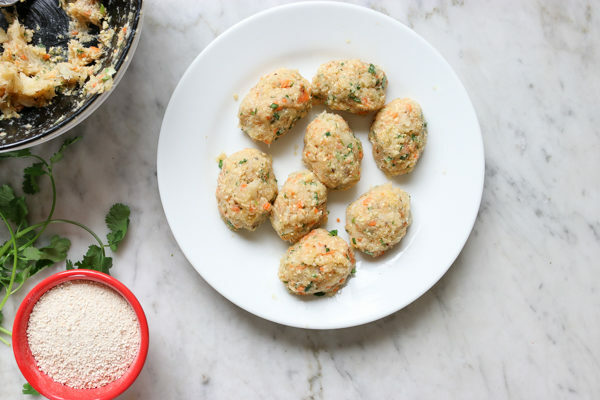 Take gefilte fish mixture and form into 8 patties. Gently place patties in the sauce, partially covered, cover with pan top or foil, and simmer on low for 20 minutes or until fish is mostly cooked and firm. 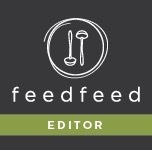 Break eggs one at a time into a ramekin and using a spoon, make divots in the sauce and pour eggs into divots one at a time, partially covering them in sauce. Cover again and simmer for 5-6 minutes until whites are cooked and yolks are still runny. Squeeze with lemon and garnish with cilantro. Serve hot with matzah! This post is sponsored by Kroger Simple Truth Organics but all opinions are my own. 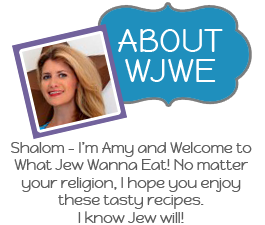 Thanks for supporting brands that support WJWE! Jew rock! Please tell me this is an April Fool’s joke. 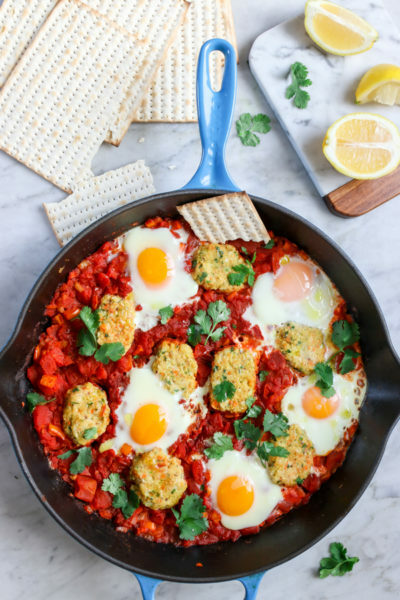 I love shakshuka and love gefilte fish. But these two together….ugh! Ha! Think of it as fish poached in a spicy tomato sauce!